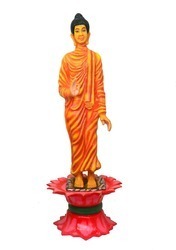 Our range of products include bear holding stem -look fountain, rose water floating pot with fountain, lady model fountain, lord buddha face step diya fountain, peacock water fountain- wedding decor and gautam buddha statue standing on lotus fountain. 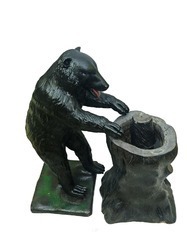 This Is A Black bear statue with Fountain, in this statue bear holds the stem of the tree and from that stem, the water comes out, in the form of a fountain. This is a unique type of fountain. 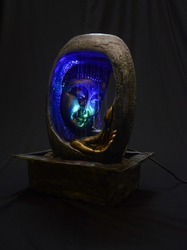 The Fountain work through electricity (Light).You can place this statue in your lounge, garden, or inside of your hotel also. This type of product you will never see anywhere. Its a unique manufacturing of waahkart. If you want to use this set individual then you can use it. Bear you can normally place as statue also. Best In quality Home Decorative accessories be it Garden. Enhance the Beauty of your House with best in class quality Products. Water fountains add an essence of beauty, twist and charm to the interiors of your home. This water fountain is not just limited to your living area, you can add this item to your office wherever you wish. Water fountains are more than just decorative accessories for your home, they are also a beautiful product which brings a positive aura to the environment. 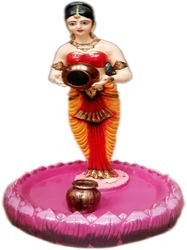 Attractive traditional lady look fountain which has vibrant colors made up of FRP finest fiber. The looks of this fountain are highly elegant and attract the eyes of the viewers. The beautiful water fountain that gives a magical Appearance, Flowing water creates a soothing and calm mood around the house. Easy assembly and operation - just plug it in, put water to see the beautiful effect. 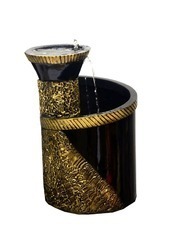 This Home Decor Water Fountain helps in giving style to your home and adds an immediate aura to the place. We are manufacturer and exporter all type of Fiber Water Fountains. 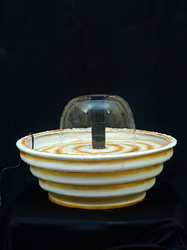 This fountain is made of unbreakable fiberglass and fitted with the motorized water system. This fountain is in running condition. This fountain can use in wedding decoration. A nice combination of neutral colors, this piece can easily find itself in many styles of decor. 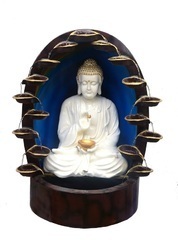 Gautam Buddha Standing on Lotus fountain is a beautiful self-contained feature which will be a great addition to any spiritual surroundings. This feature is suitable for indoor and outdoor use due to its high-quality integrated base. This expertly crafted and painted water feature will be a unique choice and will look great in any garden or indoor space. creating a relaxing atmosphere. 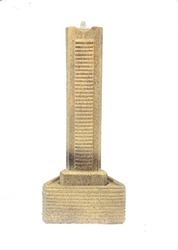 We brings the modern element that embraces the virtues of nature with this table fountain.The base of this unique fountain is made up of a high quality material with golden brown -colored cylinders that create a natural fall and fill your garden with the relaxing sound of cascading water.The glass shown in the picture is not the part of it. you can place glass of 36 inches. Weight 4.7 Kg (with Sai Baba Statue). A beautiful piece to the interiors of your home by waahkart Waterfall Fountain. Sporting unique and interesting cascading design, this vibrant colored waterfall fountain is light in weight and long lasting too. Made from the premium quality material, this indoor water fountain is highly durable and will surely complement your home decor collection. You can also use this Water fountain as a gift to your relatives, friends, and colleagues. Easy to install and maintain. A fun, decorative piece ready to add an old-fashioned, down-home touch to your garden or yard. The soothing sounds of running water matched with real fir wood and your own colorful floral arrangements. A neat way to add interest to your home's landscape. This fountain is made up of fiber reinforced plastic, In this, we given a balloon fountain through which the water is spreading in a Balloon shape. 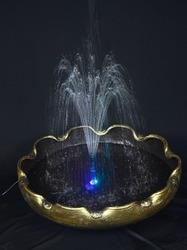 This beautiful fountain you can place anywhere in your surround whether it's indoor area or outdoor. Plants are the best way to create a natural and refreshing ambiance in your living space. 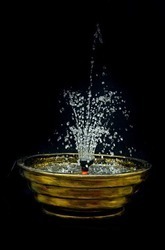 Water pours from the top into the pot and ultimately pools into the bottom of the elegant Fountain. It also has a pot for a planter. 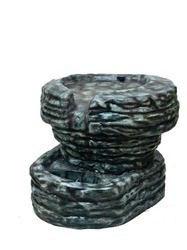 A simple yet beautiful fountain, this distressed look will make the perfect addition in your home or garden. 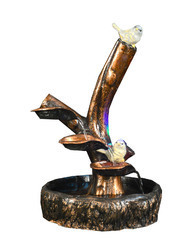 This fiber fountain is the perfect way to add the finishing touch to your garden or yard space., this water fountain is constructed out of durable fiber. 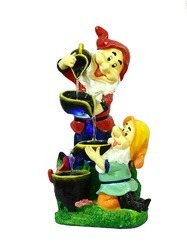 With its detailed accents, this fanciful fountain bestows an air of innocent youth. the soothing flowing water will add a calming ambiance to your space that you can enjoy anytime. 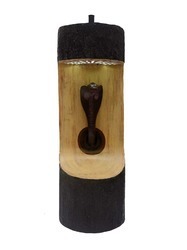 Fountain is constructed of durable Fiber to ensure that it is long lasting. This fountain is made from high-quality fiber, perfect finishing, and slip resistance which is suitable for places like buildings, villas, palaces, hotels, and others. 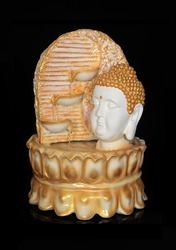 It is the ultimate Buddha fountain if you want to bring prosperity, peace, and harmony to your place of business or home. Makes your garden and interior a more peaceful and relaxing aura. Three Sided Fountain is made of high-quality Fiber reinforced plastic. The electric cord is cleverly arranged to exit the tray from the bottom so it doesn't interfere with the sleek look and design. The natural slate stone slabs are imported from overseas and the grain patterns, stone colors, and textures will have some variations. The slate floor fountain easily assembles and includes simple instructions. Completely self-contained re-circulating waterfall feature. Operates on a standard electric outlet. This Product is made up of FRP (Fiber reinforced plastic), It's an unbreakable product, This dolphin You can place near to your pool, pond or water area. 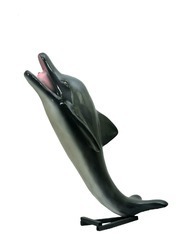 This dolphin rotates water in continuation through the water pump. This is basically used in Gardens for attracting peoples. Stunning Shivji fountain in antique color and water falling by using electricity. Made of good quality material Fiber reinforced plastic. 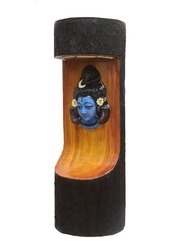 Perfect for home decor as water falling is very lucky.Shivji Deity of Hinduism,statue of Wisdom and Intellect, Handmade FRP like stone and fine painted Fountain, Colorful light in Stone with Very famous Shivji Hand painting, Competitive Price - Verified Quality - Gorgeous & Unique Buddha Bring prosperity and happiness in your home & Office, Perfect at Desk ,Home decor or as a beautiful outdoor décor. Lotus-shaped Water Balloon fountains add an essence of beauty, twist, and charm to the interiors of your home. This water Balloon fountain is not just limited to your living area, you can add this item to your, garden, hotel and wherever you wish. Water Balloon fountains are more than just decorative accessories for your home, they are also a beautiful product which brings a positive aura to the environment, sure to be admired by your guests. this amazing water fountain is easy to maintain, light in weight, and long lasting too. Beautiful indoor and outdoor Balloon fountain with undulating light color keeps that gives a magical appearance. Flowing water creates a soothing and calm mood around the house. Use a Vaastu or Feng-Shui article as representative of water. Easy assembly and operation. With thorough knowledge of changing trends of the market, we have been able to bring an exotic range of Craft Trade Wooden Snake Face Musical light and Fountain Stand. Our offered products are manufactured using high-grade quality wood. Made using the premium quality material. Each item in this range is a perfect reflection of creativity and excellence in wooden work. 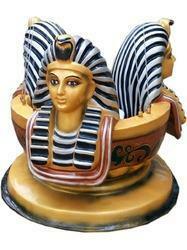 Exclusively used for gifting purpose in wedding, anniversary and all occasions or for home decoration as a showpiece. This fountain is made up of fiber reinforced plastic, in this, we were given a balloon fountain through which the water is spreading in a Balloon shape .this beautiful fountain you can place anywhere in your surround whether it's indoor area or outdoor white Metallic black with balloon fountain is different in look. This fountain is made up of fiber reinforced plastic, in this, we give a balloon fountain through which the water is spreading in a Balloon shape .this beautiful fountain you can place anywhere in your surround whether it's indoor area or outdoor .white color with balloon fountain is different in look. This fountain is made up of fiber reinforced plastic, In this, we were given a crown fountain through which the water is spreading in a droplet .this beautiful fountain you can place anywhere in your surround whether it's indoor area or outdoor. Metallic black color with crown fountain is different in look. This fountain is made up of fiber reinforced plastic, In this, we give a crown fountain through which the water is spreading in a droplet .this beautiful fountain you can place anywhere in your surround whether it's indoor area or outdoor .white color with crown fountain is different in look. 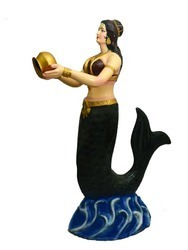 Mermaid Statue is made up of FRP (Fiber reinforced plastic).The designing on this mermaid is so real, In this statue, mermaid holds a pot, Its a working statue, You can place this mermaid statue new any floor tank or in the entrance for the non-working process. The color combination which we had taken is the object the same one which is mainly in the real mermaid. Special care is given in the finishing work of the statue. It's a weatherproof statue. 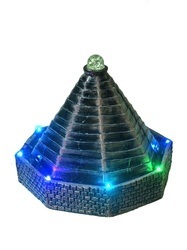 Handicraft Eight-sided fountain showpiece Feel and look like real pyramid look Unique design and beautiful colors Beautiful Led multi-color lights in each flow of water Led lights color change in every 2 seconds. Beautiful water flows through water pump machine For home and office decoration. Can use it as an indoor fountain. 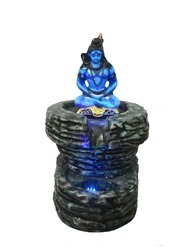 Handicraft Water fountain showpiece Feel and look like real stone Unique design and beautiful colors Beautiful Led multi-color lights in each flow of water Led lights color change in every 2 seconds. Beautiful water flows through water pump machine For home and office decoration. Can use it as indoor as well as for outdoor use. You can use the showpiece or statue of 16/14 inch over it. 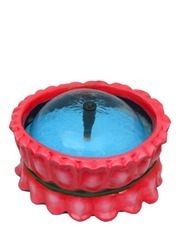 Santa fountain is any one of the best and eye-catching product. In this fountain through tub to the bucket, water flows continuously with any breakage. 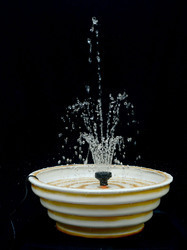 You can use this fountain in your hotel arena, home or anywhere at the table. Bright colors in Santa dress are very charming. In this fountain, we added LED multicolor light who's adding more beauty to this fountain. This beautiful and eye-catching product is made up of Fiber reinforced plastic. It is unbreakable in normal wear and tear condition. You can also use this for gifting purpose also. Unbrekable in normal & tear Conditions. Kamdhenu's another name is Surabhi. This beautiful kamdhenu is made up of Fiber, in this, we added the special feature of fountain /waterfall. 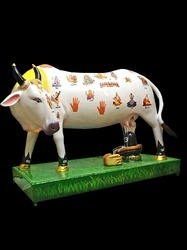 Through his udder (Than ) there is a flow of water (add white fabric color in water) like a milk pour on shivling. The aim was to ensure that all the factors come together in order to ensure that the effect of the positive energies in and around the temple increases the experience of the devotee. This beautiful Product is eye-catching in it. It will recycle the water for long days, no need to add water, again and again, It will surely increase the beauty of your surrounds. An exquisite home decoration to bring a spark of beauty into your household. Whether it's your living room or wherever you deem it fit, this is an ideal addition to your home. This unique decoration artwork from India is made from top quality and eco-friendly FRP and hand decorated which translates to its unmatchable durability, this structure will live in your home to always give you smile on your face. Perfect Gift Item: A perfect gift idea for your friends, family members, friends and loved one especially Indians or those that love India during special events like a housewarming party, Diwali, New Year, Birthday etc. 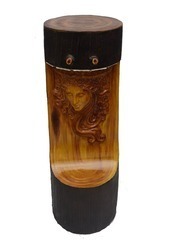 With a thorough knowledge of changing trends of the market, we have been able to bring an exotic range of Craft Trade Wooden modern lady face With Light, Music & Fountain Stand. Made using the premium quality material. Each item in this range is a perfect reflection of creativity and excellence in wooden work. Exclusively used for gifting purpose in wedding, anniversary and all occasions or for home decoration as a show piece. The beautiful piece that will add a charming touch to any home, office etc. This waterfall creates a harmony in the surroundings and is used in different applications so as to feel a pleasant environment. This beautiful lady waterfall is an eye-catching product, it will add beauty to your arena. His beautiful design makes vibrant in your surrounds. Crafted by a team of gifted artisans, the water cascades down Diya to the textured basin below. Clear your mind and melt away tension in your own private sanctuary. This Beautiful Fountain adds beauty to your surround. Crafted by a team of gifted artisans, the water cascades down Diya to the textured basin below. Clear your mind and melt away tension in your own private sanctuary. This Beautiful Fountain adds beauty to your surroundings. Can set showpiece of 50mm width inside the shade for making it as more attractive. 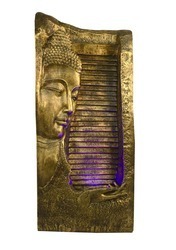 This high-quality Fiber reinforced plastic of authentic Japanese features the Buddha side face in peaceful Condition. This piece features an outstanding faux patina, for a realistic antique appearance. 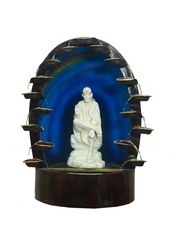 Great for accenting your personal decor or as a thoughtful gift to a loved one, this fountain and statue evokes serenity and peace of mind in the viewer. This high-quality Fiber reinforced plastic of an authentic Japanese statue features the Buddha sitting in peaceful meditation. Seated in the single building position with one stand atop. This piece features an outstanding faux patina, for a realistic antique appearance. Great for accenting your personal decor or as a thoughtful gift to a loved one, this fountain and statue evokes serenity and peace of mind in the viewer. With the extensive knowledge and experience in this respective domain we are engaged in offering high quality Sleeping Buddha Water Fountain. 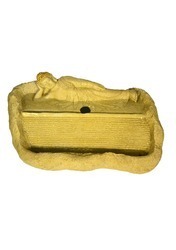 The offered fountain is precisely designed using supreme grade material and ultra-modern techniques in compliance with set industry standard. 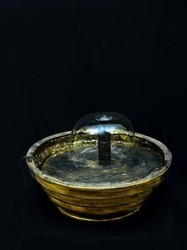 Our offered fountain is widely used for decorating and sprinkling water in various public places. 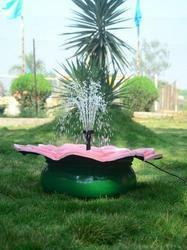 Clients can avail this fountain from us at a pocket-friendly price. This fountain is made up of Fiber reinforced plastic, which is unbreakable in normal wear an tear conditions. 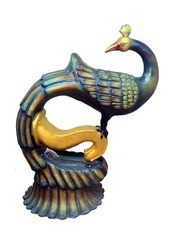 Best In quality Home Decorative accessories be it a hall, Drawing Room, Bedroom or Living Room. Enhance the Beauty of your House with best in class quality Products. Water fountains add an essence of beauty, twist, and charm to the interiors of your home. This water fountain is not just limited to your living area, you can add this item to your bedroom, dining, balcony and in office wherever you wish. Water fountains are more than just decorative accessories for your home, they are also a beautiful product which brings a positive aura to the environment. With a thorough knowledge of changing trends of the market, we have been able to bring an exotic range of Craft Trade Wooden Snake Face Musical light and Fountain Stand. Our offered products are manufactured using high-grade quality wood. Made using the premium quality material. Each item in this range is a perfect reflection of creativity and excellence in wooden work. Exclusively used for gifting purpose in wedding, anniversary and all occasions or for home decoration as a showpiece. The beautiful piece that will add a charming touch to any home, office etc. This product available with Music light and Fountain also. Pink seahorse Fountain decoration has the finest details and highest quality you will find anywhere! attractive seahorse fountain decor is truly remarkable. if you want the delicate sound of water falling gently which is known to soothe and calm people, then you won't get it with this. In fact, you get the slightly irritating sound of the suction drain. This showpiece has been diligently handcrafted by skilled artisans of India using various traditional techniques. This two-tier decor can hold water at both the levels and is perfect for decorating entrance for a most welcome sight. Our relaxing FRP made Garden Water Fountain Egyptian queen look, reminiscent of nature, and made from FRP, which is unbreakable and waterproof. Whether you are alone relaxing on your own or enjoying with your loved ones. 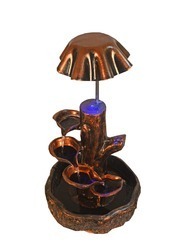 Add a whimsical water feature to your outdoor patio or water fountain. This fountain features water draining from the Egyptian queen's head, with one Ex-team Water Fountain.